What is Obstructive Sleep Apnea (“OSA”)? Obstructive sleep apnea (OSA) is a sleep disorder that involves cessation or significant decrease in airflow while breathing during the sleeping. There are various degrees of OSA including mild, modrate to severe sleep apnea. Additiona to OSA, there is also a more dangerous version of sleep apnea known as Central Sleep Apnea (CSA) which is a nervous system disorder. 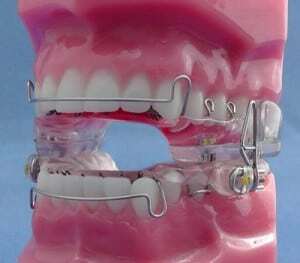 Commonly, long term therapy, such as continuous positive airway pressure (CPAP) and/or oral appliance therapy, such as mandibular advancement appliances (MAD), have been utilized as treatment. However, a recent form of treatment, biomimetic oral appliance therapy (BOAT), offers and alternative non-surgical method, which can putatively resolve OSA by combined maxilla-mandibular correction, and addressing craniofacial deficiencies. Multiple studies have determined that BOAT induced craniofacial and airway changes produce a more favorable result, resulting in an optimally reshaped upper airway, which results in a reduction in the severity of sleep disordered breathing, thereby effectively resolving the disorder of sleep apnea. What is the DNA Sleep Appliance Device? Typically, dental oral appliances used to manage snoring and obstructive sleep apnea are mandibular advancement devices that simply protrude the lower jaw. These devices are worn over a lifetime, and do not address the underlying etiology of the condition. In contrast, Dr. May advocates that treating the underlying cause of OSA is a superior approach that improves not just the symptoms of OSA, but resolves the OSA itself. Dr. May’s FDA approved, superior treatment option is the DNA Appliance know as mRNA(T) which works through upper airway remodeling or Pneumopedics® to re-develop the airway so that underlying sleep apnea can be resolved in some mild and moderate cases. The biomimetic technique of the DNA is significantly different from standard dental MAD because instead of simply repositioning the mandible, the patented, FDA-registered Daytime-Nighttime Appliance® system (or DNA appliance®), which is worn during the evening and at night, allows the body to gently increase the size of the upper jaw and increase the volume of the nasal airway, sometimes to the extent that the underlying issues are completely eliminated. In addition, the FDA-cleared, patented, mandibular Repositioning-Nighttime Appliance® (or mRNA appliance®) is a biomimetic oral appliance that provides combined maxillo-mandibular correction. 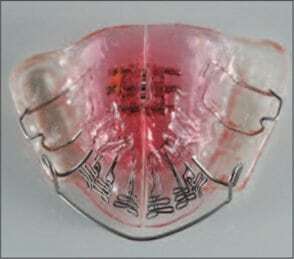 The mRNA appliance is worn at night, and this allows the body to reposition the mandible while gently redeveloping the midface, as well as remodeling the upper airway in adults, while correcting the positions of the teeth into a more natural position. Our Obstructive Sleep Apnea Appliances utilize the advanced scientific principles and technology of Neuromuscular dentistry. This means that Dr. May plans, observes and measures exactly how the sleep apnea appliance will affect the TMJ joint and the surrounding muscles of the jaw. As the Connecticut Sleep Apnea expert, he takes considerable time to ensure that every patients’ appliance is fabricated while the patient is able to maintain the most relaxed position for their jaw joint and facial muscles. This muscular relaxation process takes about an hour and a half and is achieved through the use of TENS therapy (Transcutaneous Electrical Nerural Stimulation). The relaxed and comfortable position for the patients’ lower jaw is then extensively verified through the use of computer Electomyography (EMG’s) and Jaw Tracking technology to ensure the mDNA appliance will be clinically effective and extremely comfortable each and every night of wear. Why is the expert fitting of the oral sleep appliance critical? Setting the mRNA Oral Appliance to keep the lower jaw in the most relaxed position will virtually eliminate any morning jaw or facial soreness that most often occurs with many other “arbitrarily” made dental sleep appliances. These “arbitrary” starting positions also promote further torquing of the lower jaw which leads to torquing of the spine’s C1 and C2 around the brain stem which is also the location of the respiratory center within the brain. This can lead to a possible Central Sleep Apnea (CSA) condition that takes place in the central nervous system. Overall, if the prescribed dental appliance is not comfortable and causes the patient facial, muscle, and TMJ pain, the patient will most likely not wear it. This results in non-compliance of OSA treatment, leaving OSA untreated which can lead to a wide array of other serious medical conditions. For patients who are habitually plagued by clenching, grinding and waking up with sore TMJ joints and migraines, there are tremendous benefits. By maintaining the jaw’s most relaxed muscular position, mDNA will virtually eliminate all of these symptoms. This means, that Dr. May is able to effectively treat not only the OSA itself, but also any pathological clenching / grinding habits a patient may have, alleviating debilitating TMJ discomfrot and migraine pain! How great would that be to not clench or grind one’s teeth anymore at night time, all while effectively treating the obstructive sleep apnea while getting a mini facelift! Patients have been extraordinarily increasing interest in facial macro aesthetics and micro aesthetics, which has significantly increased the use of facial fillers in the lower face to reduce aging effects, wrinkles and improve upper lip fullness. Indeed, cosmetic injection around the lips and perioral area is thought to be a way to provide aesthetic improvement of age changes around the mouth as well as lip augmentation.2 It has also been suggested that intramuscular injection of Botulinum toxin type A (Botox) is an effective way of preventing damage to dental hard tissues and restorations by deprogramming the muscles responsible for the destructive forces.3 But, despite the invasive nature of these procedures, injection of dermal fillers has also been deployed for facial soft-tissue augmentation.4 Unfortunately, there have been some adverse reports on injectable, nonbiodegradable fillers.5 Therefore, noninvasive, natural methods of craniofacial enhancement are preferred by Dr. Yuriy May. In additional, Dr. May has observed positive results in clinical changes that are consistent with increased craniofacial symmetry and volume, consistent with numerous publications documenting the improve facial aesthetic phenomenon as a substitute to potentially dangerous facial fillers. What is a dental device and how does it work? Mandibular advancement devices are by far the most common type of dental sleep device available for the treatment of snoring and Obstructive Sleep Apnea (OSA). They are also sometimes called oral appliances, or dental sleep devices. Mandibular Advancement Devices (MADs) open the airway by moving the mandible (the lower jaw) forward. The tongue is attached to the lower jaw behind the chin. As the jaw is moved forward, the collapsible part of your airway is held open by the forward movement of the tongue and other airway muscles.Mandibular Advancement Devices (MADs) also improve the strength and rigidity of the airway by increasing the muscle activity of the tongue and other muscles of the airway. Often the problems associated with Continuous Positive Airway Pressure (CPAP) therapy are due to high pressures and uncomfortable fit of the nose or face mask. Your Dental Sleep Solutions® dentist can work directly with your sleep physician to make a combination dental sleep device that is worn in combination with your CPAP. This custom-made dental sleep device or oral appliance will attach directly to your CPAP machine. When CPAP is combined with jaw advancement from a mandibular advancement device, the CPAP can often be used at a much lower pressure setting. What other treatments for snoring and Obstructive Sleep Apnea (OSA) are available? Treatment options for a patient suffering from sleep apnea include Dental Device Therapy (learn about dental device therapy here), CPAP, Surgery, Positional Therapy, and Weight Loss. CPAP was developed in the early 1980’s and was the first viable solution for treating the CPAP examples for treating obstructive sleep apnea insidious disease of Obstructive Sleep Apnea (OSA). Most physicians prescribe CPAP as a first treatment option, though many physicians now utilize dental devices as a first line of therapy for mild to moderate disease OSA. CPAP treatment consists of a pump that delivers positive air pressure to a mask that is fitted over the nose and/or the mouth. The air pressure is adjusted until the airway is forced open, much like blowing up a balloon. CPAP is a very effective therapy WHEN it is used. If you’ve been diagnosed with sleep apnea and were prescribed a CPAP by your physician, you know exactly what we mean when we say WHEN it is used; compliance is the biggest challenge with this therapy. Most people find that wearing a mask and having air pushed down their throat is a challenge. The problems patients complain about from CPAP therapy are very real and often difficult, if not impossible, to overcome. Do you currently use CPAP and have problems? Masks come in many shapes and sizes. Some go over just your nose; some your nose and mouth; others simply have a small tube that fits into your nose. Sometimes switching masks can help you. Work with the DME (Durable Medical Equipment) company where you got your CPAP. They are experts at helping people adapt to the therapy. The constant air moving through your airway and across your mucous membranes tends to dry you out; so adding humidification to your CPAP can help. Heat can also be added and can make a significant difference, especially in Northern climates and the winter time. If your pressure seems to be just too much, you may want to ask your physician if a BiPAP is a possible solution. BiPAP machines have a sensor in them that adjust the pressure based on whether you are trying to inhale or exhale. The sensor lowers the pressure when you are trying to exhale and makes it easier to get air out. Most surgeries are performed by Ear Nose and Throat (ENT) physicians, though Oral and Maxillofacial (OMS)surgeons are also generally able to perform surgeries to treat Obstructive Sleep Apnea. Surgery is appealing to many patients because if it works, you are usually cured. However, Surgery carries many severe and potentially life-threatening risks that should be discussed in detail with your physician so that you can evaluate the risk and reward for this treatment option. Dental devices can often be used as an initial treatment, and surgery used later if desired. Singh GD, Chapman C and Preble M.Craniofacial Changes after CombinedAtlas-Orthogonal and Biomimetic Oral Appliance TherapyA. Vertebral Subluxation Res. 2014; Dec 18: 211-218. Singh GD, Griffin TM and Chandrashekhar R.Biomimetic Oral Appliance Therapy in Adults with Mild to Moderate Obstructive Sleep Apnea. Austin J Sleep Disord. 2014;1(1): 5. Singh GD, Heit T, Preble D. Changes in 3D Midfacial Parameters after Biomimetic Oral Appliance Therapy in Adults. J Ind Orthod Soc 2014;48(2):104-108. Chapman C, Singh GD Combined Effect of a Biomimetic Oral Appliance and Atlas Orthogonist Cervical Adjustment on Leg Lengths in AdultsA. Vertebral Subluxation Res. 2013; Aug 15: 46-50. Singh GD, Harris W.Resolution of a ‘Gummy Smile’ and Anterior Open Bite Using the DNA appliance®.J Am Orthod Soc. 2013; 13(4): 30-34. Singh GD, Callister JD Effect of a Maxillary Appliance in an Adult with Obstructive Sleep Apnea: A Case Report. Cranio. 2013 July; 31(3):171-179. Singh GD, Ataii P. Combined DNA appliance™ and Invisalign™ therapy without interproximal reduction: A Preliminary Case Series J Clin Case Rep 2013; (3:5): 1-3. Singh GD, Cress S. Case Presentation: Effect of combined full mouth rehabilitation and oral appliance therapy on obstructive sleep apnea. Dialogue: AADSM. 2013; (2): 18-20. Singh GD, Utama J. Effect of the DNA appliance™ on migraine headache: case report Int J Orthod Milwaukee. 2013 Spring; 24(1):45-49. Singh GD, Cress S, McGuire M, Chandrashekhar R. Case Presentation: Effect of Mandibular Tori Removal on Obstructive Sleep Apnea ParametersDialogue: AADSM. 2012; (1): 22-24. Singh GD, Wendling S, Chandrashekhar R Midfacial development in adult obstructive sleep apnea.Dent Today. 2011; 30(7): 124-127. Williams DE; Lynch JE, Vidhi Doshi, Singh GD, Hargens A.Bruxism and Temporal Bone Hypermobility In Patients with Multiple Sclerosis.Cranio. 2011 July; 29(3):1-9. Cress S.Beyond Braces, Botox and FillersAe Dent. 2011 Fall; 12-16. Singh GD Epigenetic orthodontics: Developmental Mechanisms of Functional(Formational) Orthodontic Appliances Am Orthod Soc. 2010; 10(6): 16-26. Celenk M, Farrell ML, Eren H, Kumar K, Singh GD, Lozanoff S.Upper airway detection and visualization from cone beam image slices.J X-Ray Sci Technol. 2010; 18(2): 121-135. Mitani Y, Banabilh SM, Singh GD. Craniofacial changes in patients with Class III malocclusion treated with the RAMPA system. Int J Ortho. 2010 Summer; 21(2): 19-25. Banabilh SM, Suzina AH, Mohamad H, Dinsuhaimi S, Samsudin AR, Singh GD Assessment of 3-D nasal airway morphology in Southeast Asian adults with obstructive sleep apnea using acoustic rhinometry Clin Oral Investig. 2009 Sep 30. Singh GD.Ostensibly erroneous.Brit Dent J. 2009; 207(2): 52-53. Singh GD, Maher GH, Padilla RR.Customized mandibular orthotics in the prevention of concussion/mild traumatic brain injury in football players: A preliminary study. Dent Trauma. 2009; 25(5): 515-521. Banabilh SM Suzina AH, Dinsuhaimi S, Samsudin AR, Singh GD.Dental arch morphology in South East Asian adults with obstructive sleep apnea: Geometric morphometrics J Oral Rehabil. 2009; 36(3), 184-192. Singh GD, Abramson M. Response to comments on Effect of an intra-oral nasal dilation appliance on 3-D nasal airway morphology in adults. Sleep Breath. 2008 12(2): 183-4. Banabilh SM, Suzina AH, Dinsuhaimi S, Singh GD. Craniofacial obesity in patients with obstructive sleep apnea Sleep Breath. 2008; 13(1), 19-24. Singh GD, Abramson M. Effect of an intra-oral nasal dilation appliance on 3-D nasal airway morphology in adults. Sleep Breath. 2008; 12(1): 69-75. Singh GD.Digital diagnostics: Three-dimensional modeling. Brit J Oral Max Surg. 2008; 46(1): 22-26. Banabilh SM, Suzina AH, Dinsuhaimi S, Singh GD. Cranial base and airway morphology in adult Malays with obstructive sleep apnea. Aust Orthod J. 2007; 23: 89-95. Singh GD, Levy-Bercowski D, Yañez MA, Santiago PEThree-dimensional facial morphology following surgical repair of unilateral cleft lip and palate in patients after nasoalveolar molding. Orthod Craniofac Res. 2007; 10(3): 161-6. Singh GD, Olmos SUse of a sibilant phoneme registration protocol to prevent upper airway collapse in patients with TMD Sleep Breath. 2007; 11(4): 209-216. Singh GD, García AV, Hang WM. Evaluation of the posterior airway space following Biobloc therapy: Geometric morphometrics.Cranio. 2007; 25(2): 84-89. Singh GD.Outdated definition. Brit Dent J. 2007; 203(4): 174. Singh GD.Spatial matrix hypothesis. Brit. Dent. J. 2007; 202(5): 238-239. Banabilh SM, Rajion ZA, Samsudin AR, Singh GD. Facial soft tissue features assessed with finite element analysis. Int J Orthod. 2006; 17(4): 17-20. Banabilh SM, Rajion ZA, Samsudin AR, Singh GD. Dental arch shape and size in Malay schoolchildren with Class II malocclusion. Aust Orthod J. 2006; 22: 99-103. Lopez Del Valle LM, Singh GD, Feliciano N, Machuca M Del C.Associations between a history of breast feeding, malocclusion and parafunctional habits in Puerto Rican children.PR Health Sci J. 2006; 25(1): 31-34. Singh GD, Maldonado L, Thind BS. Changes in the soft tissue facial profile following orthodontic extractions: a geometric morphometric study.Funct Orthod. 2004 Winter – 2005 Spring; 22(1): 34-8. Singh GD, Diaz J, Busquets-Vaello C, Belfor TR..Facial changes following treatment with a removable orthodontic appliance in adults.Funct Orthod. 2004 Jul-Sep; 21(3): 18-20, 22-3. Belfor TR, Singh GD.Developing dental arch symmetry using the Homeoblock device Int J Orthod Milwaukee. 2004 Fall; 15(3): 27-30. Singh GD, Rivera-Robles J, de Jesus-Vinas JM. Longitudinal craniofacial growth patterns in patients with orofacial clefts: geometric morphometrics. Cleft Palate Crano J. 2004 Mar; 41(2): 136-43..
Singh GD, Kutcipal E, McNamara JA. Deformations of the midfacial complex in twins with orofacial clefts.Cleft Palate Craniofac J. 2003 Jul; 40(4): 403-408. Singh GD, Clark WJSoft tissue changes in patients with Class II Division 1 malocclusions treated using Twin Block appliances: finite-element scaling analysis.European Journal of Orthodontics. 2003; (25): 225-230. Singh GD, Thind BS.Effects of the headgear-activator Teuscher appliance in the treatment of Class II Division 1 malocclusion: a geometric morphometric study. Cleft Palate Crano J. 2004 Mar; 41(2): 136-43..
Agrait EM, Levy D, Gil M, Singh GD. Repositioning an inverted maxillary central incisor using a combination of replantation and orthodontic movement: a clinical case reportPediatr Dent. 2003 Mar-Apr; 25(2): 157-60. .
Singh GD.Morphospatial analysis of soft-tissue profile in patients with Class II Division 1 malocclusion treated using twin block appliances: geometric morphometrics.Orthod Crainofac Res. 2002 Feb; 5(1): 38-50. Cerajewska TL, Singh GD.Changes in soft tissue facial profile of craniofacial microsomia patients: geometric morphometrics Int J Adult Orthod Orthagnath Surg. 2001; 16(1): 61-71. Sjamsudin J, David D, Singh GD. An Indonesian child with orofacial duplication and neurocristopathy anomalies: case report. J Crainomaxillofac Surg. 2001 Aug; 29(4): 195-7. Hay AD, Singh GD.Mandibular transformations in prepubertal patients following treatment for craniofacial microsomia: thin-plate spline analysis Clin Anat. 2000; 13(5): 361-72. Singh GD, McNamara JA Jr, Lozanoff SMidfacial morphology of Koreans with class III malocclusions investigated with finite-element scaling analysis. J Crainofac Genet Dev Biol. 2000 Jan-Mar; 20(1): 10-8. Singh GD, McNamara JA Jr, Lozanoff S.Comparison of mandibular morphology in Korean and European-American children with Class III malocclusions using finite-element morphometry.J Orthod. 2000 Jun; 27(2): 135-42. Singh GD, Hay AD.Morphometry of the mandible in prepubertal craniofacial microsomia patients following an inverted L osteotomy Int J Adult Orthodon Orthgnath Surg. 1999; 14(3): 229-35. Singh GD, McNamara JA Jr, Lozanoff S.Allometry of the cranial base in prepubertal Korean subjects with class III malocclusions: finite element morphometry. Arch Oral Bio. 1999 May; 44(5): 429-39. Singh GD.Morphologic determinants in the etiology of class III malocclusions: a review.Clin Anat. 1999; 12(5): 382-405. Singh GD, McNamara JA Jr, Lozanoff S.Soft tissue thin-plate spline analysis of pre-pubertal Korean and European- Americans with untreated Angle’s Class III malocclusionsJ Crainofac Genet Dev Biol. 1999 Apr-Jun; 19(2): 94-101. Singh GD, McNamara JA Jr, Lozanoff SFinite-element morphometry of soft tissues in prepubertal Korean and European-Americans with Class III malocclusions. Arch Oral Biol. 1999 May; 44(5): 429-36. Singh GD, McNamara JA Jr, Lozanoff S Finite-element morphometry of soft tissue morphology in subjects with untreated Class III malocclusions. Angle Orthod. 1999 Jun; 69(3): 215-24. Mossey P, Singh GD, Smith MEMore extensive analysis is needed when assessing facial structure in SIDS. BMJ. 1999 Feb 6; 318(7180): 396-7. Singh GD, McNamara JA Jr, Lozanoff SCraniofacial heterogeneity of prepubertal Korean and European-American subjects with Class III malocclusions: procrustes, EDMA, and cephalometric analyses. Int J Adult Orthod Orthognath Surg. 1998; 13(3): 227-40. Singh GD, McNamara JA Jr, Lozanoff SMandibular morphology in subjects with Class III malocclusions: Finite-element morphometry. Angle Orthod. 1998 Oct; 68(5): 409-18. Singh GD, McNamara JA Jr, Lozanoff SProcrustes, Euclidean and cephalometric analyses of the morphology of the mandible in human Class III malocclusions.Arch Oral Bio. 1998 Jul; 43(7):535-43. Saunders NC, Birchall MA, Armstrong SJ, Killingback N, Singh GD.Morphometry of paranasal sinus anatomy in chronic rhinosinusitis: a pilot study. Arch Otolaryngol Head Neck Surg. 1998 Jun; 124(6): 656-8. Singh GD, McNamara JA Jr, Lozanoff SMorphometry of the midfacial complex in subjects with class III malocclusions: Procrustes, Euclidean, and cephalometric analyses. Clin Anat. 1998; 11(3): 162-70. Singh GD, McNamara JA Jr, Lozanoff S.Finite element morphometry of the midfacial complex in subjects with Angle’s Class III malocclusions. J Crainofac Genet Dev Biol. 1997 Jul-Sep; 17(3): 112-20. Singh GD, McNamara JA Jr, Lozanoff S.Thin-plate spline analysis of the cranial base in subjects with Class III malocclusion Eur J Orthod. 1997 Aug; 19(4): 341-53. Singh GD, McNamara JA Jr, Lozanoff S.Spline analysis of the mandible in human subjects with class III malocclusion.Arch Oral Biol. 1997 May; 42(5): 345-53. Singh GD, McNamara JA Jr, Lozanoff S.Morphometry of the cranial base in subjects with Class III malocclusionJ Dent Res. 1997 Feb; 76(2): 694-703. Singh GD, McNamara JA Jr, Lozanoff SLocalisation of deformations of the midfacial complex in subjects with class III malocclusions employing thin-plate spline analysisJ Anat. 1997 Nov; 191(pt 4) 595-602.